Tired of tossing an apple in your purse for a snack and retrieving it later only to find it battered and impaled on your house keys? 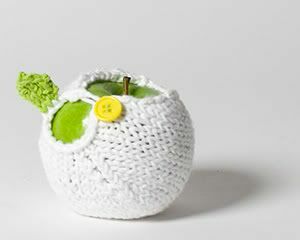 Never eat a bruised apple again with this hand-knit, 100% cotton sleeve. Topped off with a knit leaf detail and button closure, these apple jackets aren't exactly armor, but they sure are adorable! Get one to keep your apple, pear, peach, etc. safe or give to a teacher as a great gift.